Hic Sunt Dracones, or Here be Dragons, was an expression ancient explorers used on maps to signify areas of some threat or unknown danger. Who would think that this expression could be applied to the land beyond Tievedockaragh? I parked my car at J216 237 A at a forestry entrance. The forest is partly cleared here and Batts Wall runs alongside the forest up to Tievedockaragh and on to Shanlieve. I asked some joggers about Tievedockaragh and if they had any useful local knowledge. “Ah I know the wall runs all the way up. It passes the Mass Rock. The wall gets steep and there are ropes up there to help you get up along it. It gets a bit wet after that. Quite wet, so take care” Ropes? A bit wet? Take care? This sounded ominous! I followed the wall up and saw the Mass Rock off to the left, which is a large Cross on a rock looking proudly out over the valley below. The ground was indeed steep at times and required concentration and effort to avoid slipping. But there were no ropes and the biggest problem was preventing myself from sliding on the wet and, at times, eroded grassy slope. Soon the wall left the forest behind and continued SE uphill. I stayed to the left of the wall to get shelter from the sharp wind and driving rain. As the wall levelled off on Tievedockaragh I crossed it via stone steps and headed south for 50 metres or so to find the summit at J222 232 B. From the car this took about 35 minutes to reach. The summit is nothing more than a few boulders. Views were non-existent due to the bad weather, so I didn’t hang around. Returning to the wall I re-crossed it and followed it east towards the Castle Bog and Shanlieve. As the wall nears the flat bog it is replaced by a fence which continues across the bog before the wall reappears on the other side about a half kilometre away. I asked myself two questions: 1 – Why doesn’t the wall continue across the bog? 2 – Where is the small lake/pond named Shanlough that is marked on the map in the middle of this bog? Here Be Dragons is the best way to describe the next part of my route across the bog. 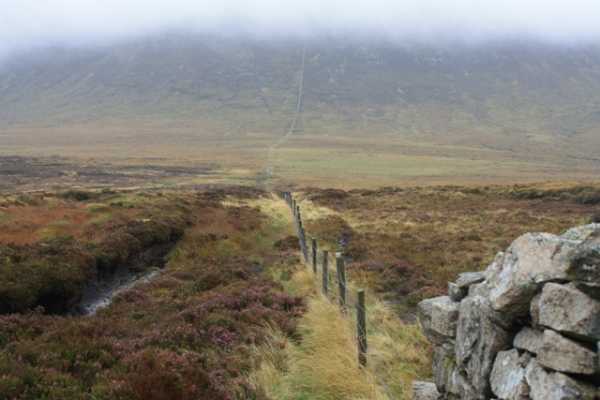 Question 1 was answered– the wall does not continue across the bog because it would simply sink out of view! Question 2 was also answered – the missing lake was beneath my feet! It would seem that perhaps the water has subsided to just below the level of the bog. It was scary! It was possible to use the small fence to slowly get across the bog. I wouldn’t recommend this as I genuinely believe the bog/lake could swallow a person up in places. Better to give this area a wide berth and navigate off to the north or south.